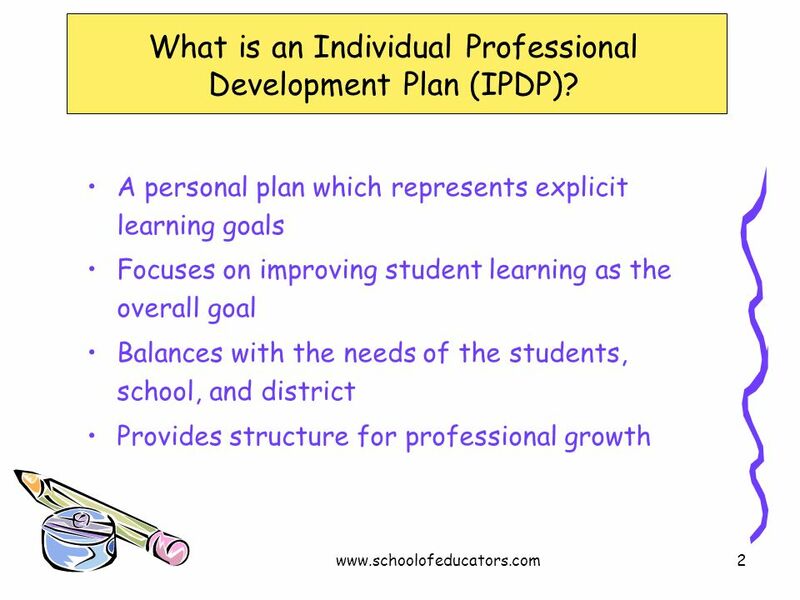 2 What is an Individual Professional Development Plan (IPDP)? 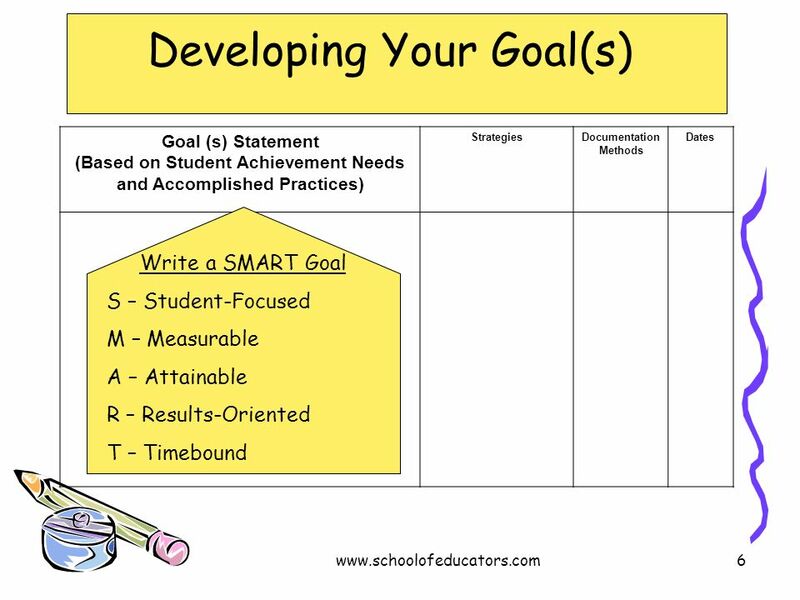 Goal(s) Specific to the students to whom the teacher is assigned Measurable improvements in student performance Method of evaluation Strategies Clearly defined training objectives The State identifies in the PD Protocol Standards and these four criteria are identified as the four components that are to be included in a Teacher IPDP. 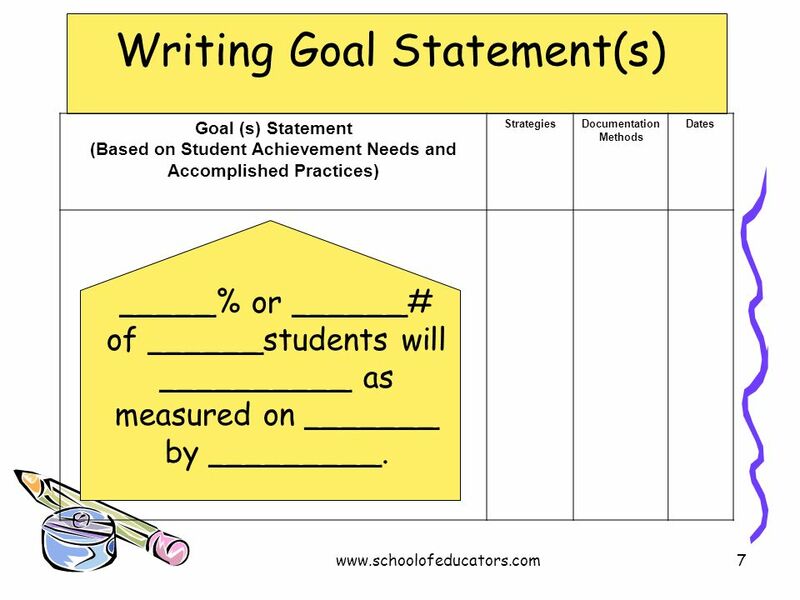 Goal (s) Statement (Based on Student Achievement Needs and Accomplished Practices) Strategies Documentation Methods Dates _____% or ______# of ______students will __________ as measured on _______ by _________. 9 What’s Wrong With These Goals? Reading improvement is a priority for everyone Reading can be addressed in the IPDP A Reading Goal To improve student performance in reading Reading Strategies To improve student learning in another area or discipline Reading is a priority in our District and every teacher should consider the reading needs of their students. 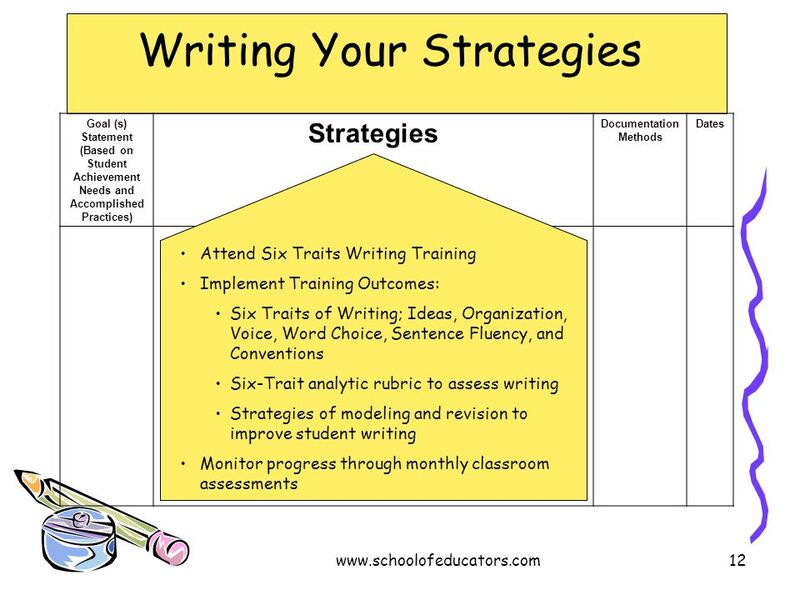 Since reading is the most important life-long learning skill, it is important to every content area and discipline. 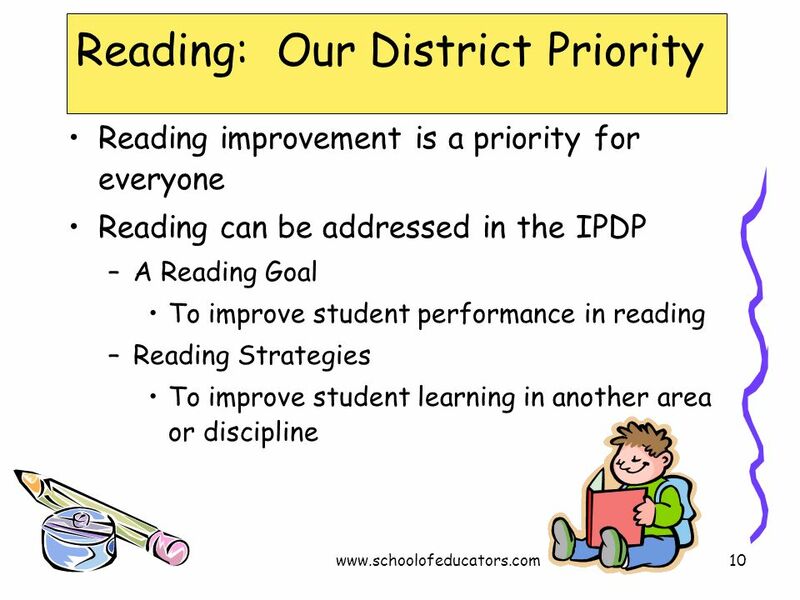 The District has contacted the DOE regarding the requirement of a reading goal on every teacher IPDP. The DOE and Just Read! 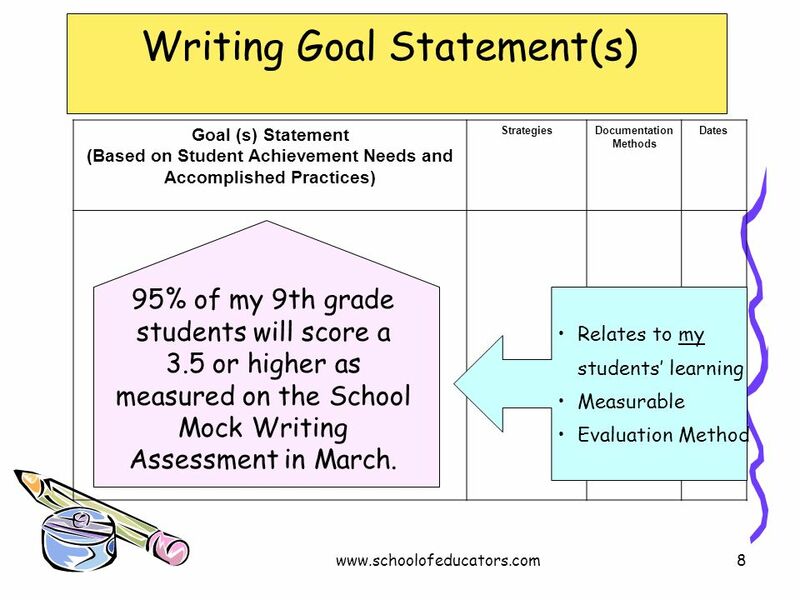 Florida have indicated that, while a reading goal is not a requirement, consideration of a reading goal is strongly encouraged. 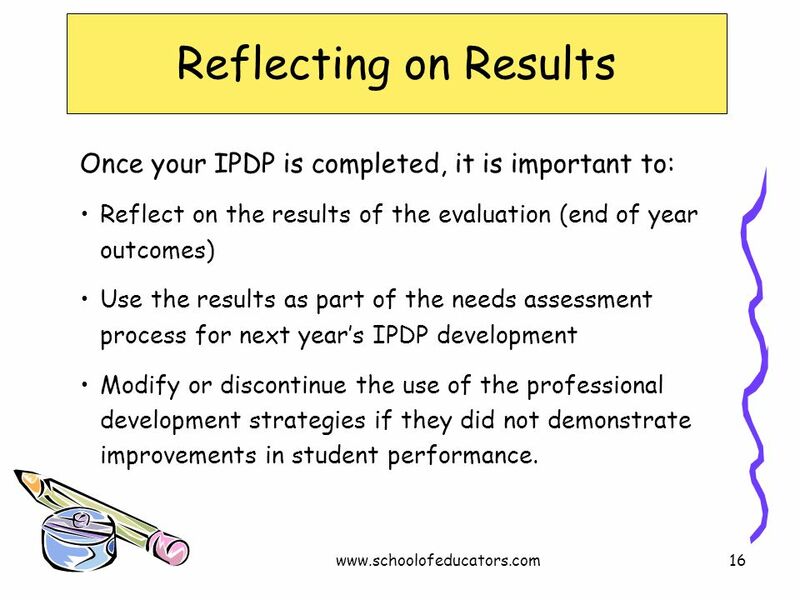 Reflect on the results of the evaluation (end of year outcomes) Use the results as part of the needs assessment process for next year’s IPDP development Modify or discontinue the use of the professional development strategies if they did not demonstrate improvements in student performance. For more information . 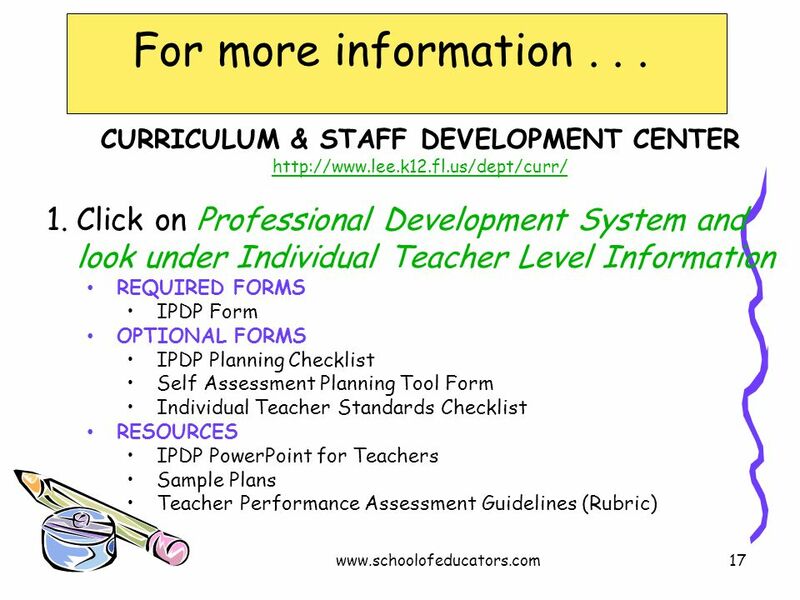 . . CURRICULUM & STAFF DEVELOPMENT CENTER Click on Professional Development System and look under Individual Teacher Level Information REQUIRED FORMS IPDP Form OPTIONAL FORMS IPDP Planning Checklist Self Assessment Planning Tool Form Individual Teacher Standards Checklist RESOURCES IPDP PowerPoint for Teachers Sample Plans Teacher Performance Assessment Guidelines (Rubric) To assist teachers in the development of their IPDP, we have an online tutorial program, sample plans and other planning tools. 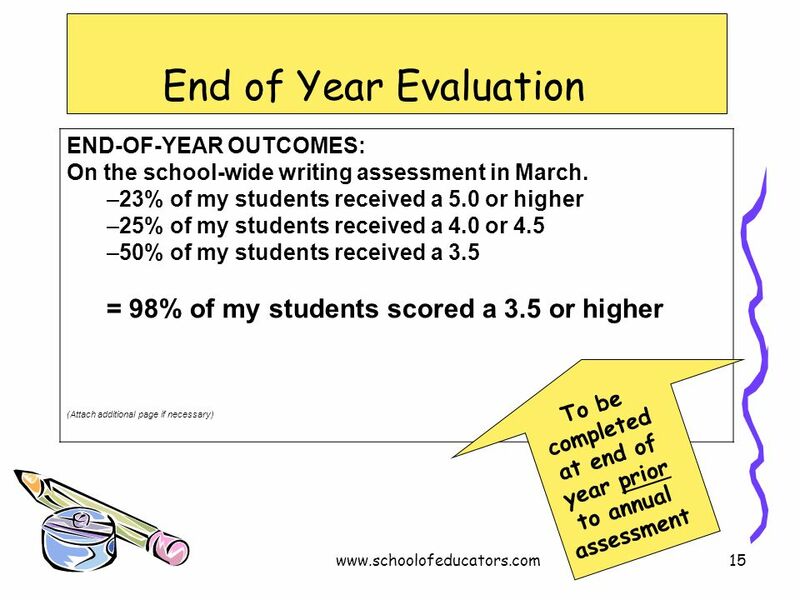 We are also creating a data collection tool for teachers to use to record their beginning of the year student data. 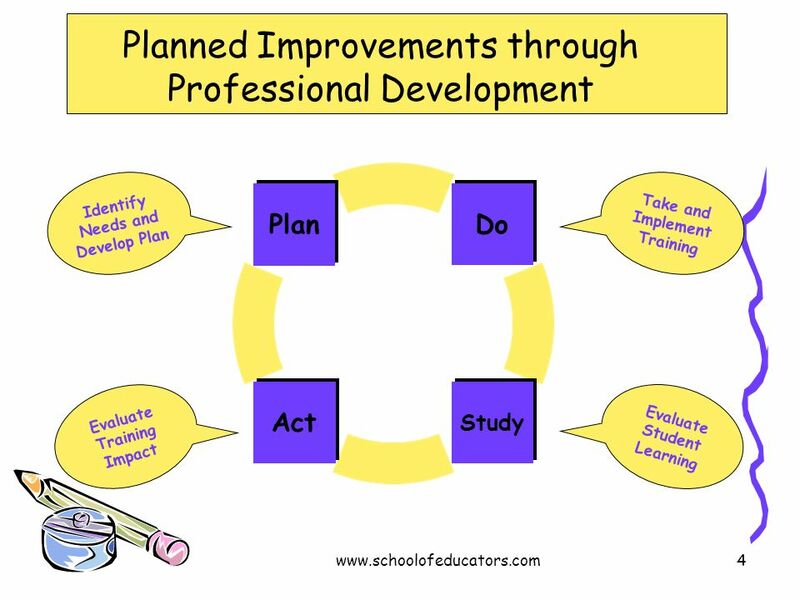 18 Why focus on Teacher Professional Development? Research shows that each dollar spent on recruiting high-quality teachers and deepening their knowledge and skills nets greater gains in student learning than any other use of an education dollar. 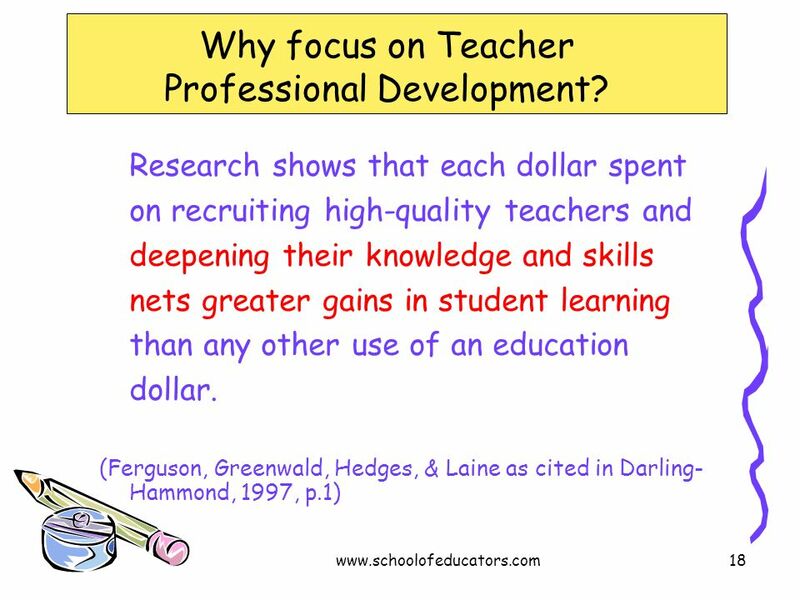 (Ferguson, Greenwald, Hedges, & Laine as cited in Darling-Hammond, 1997, p.1) Why is so much emphasis placed on teacher professional development? One reason - Teacher expertise, teacher quality, is the single most important determinant of student achievement. 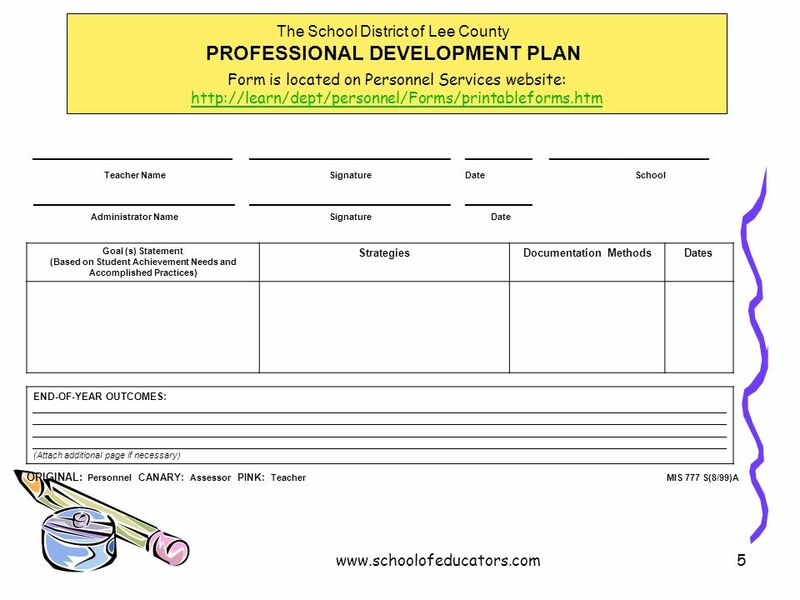 Download ppt "Individual Professional Development Planning for Teachers"
1 Citrus County 21 st CCLC Progress Report Larry Parman External Evaluator. 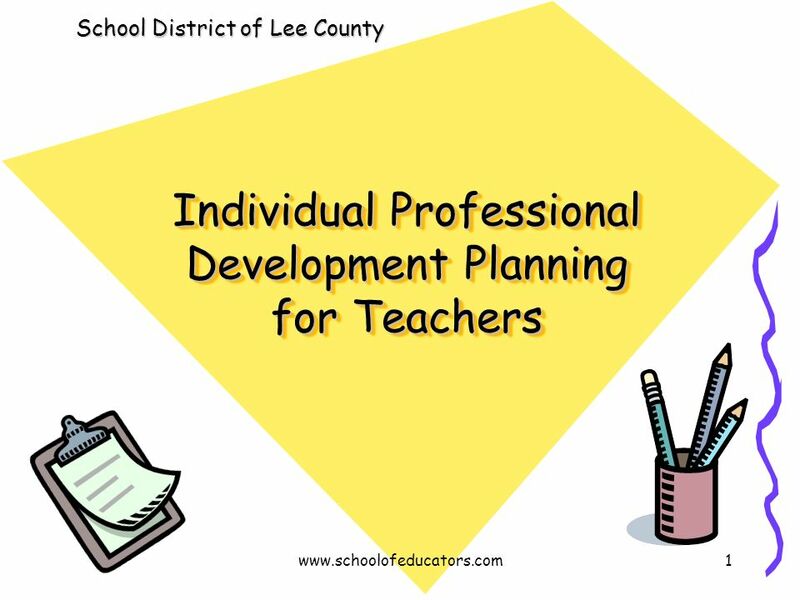 Individual Professional Development Plan Santa Rosa District Schools School Year. Data Analysis Training PDP Goals & Strategies September, 2012. Data Team Training Data & Deliberate Practice September, 2013. New Title I/NCLB Directors Workshop NCLB Winter Conference January 16, 2007 Alaska Department of Education & Early Development Margaret MacKinnon, Title. 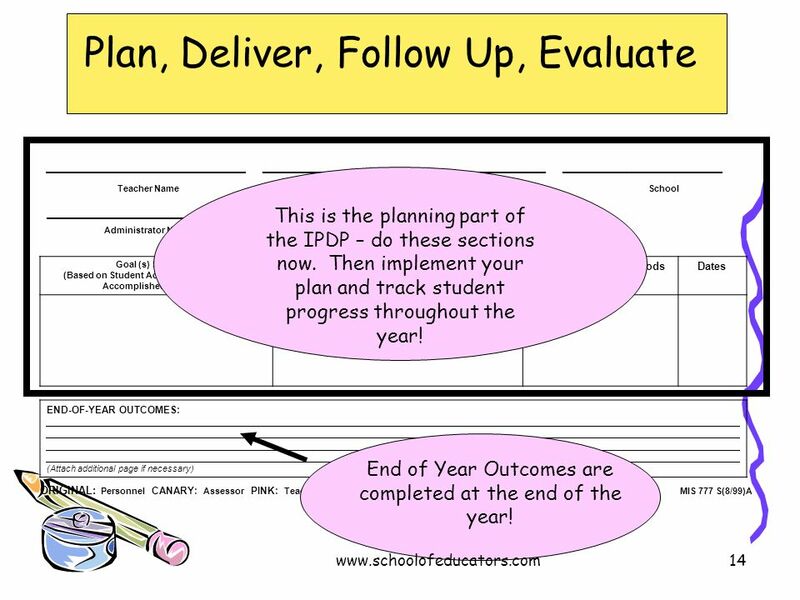 Performance Review 101 A Guide to the Alaska Teacher Performance Review 1. 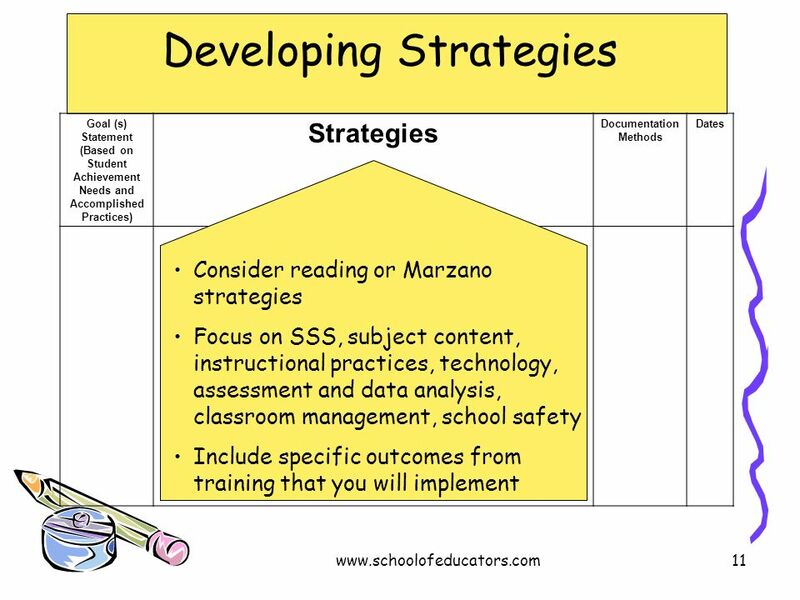 [Your District's] Comprehensive Guidance Program: Linking School Success with Life Success 1 [Your District’s] Comprehensive Guidance Program Responsive. 1 SESSION 5- RECORDING AND REPORTING IN GRADES R-12 Computer Applications Technology Information Technology. 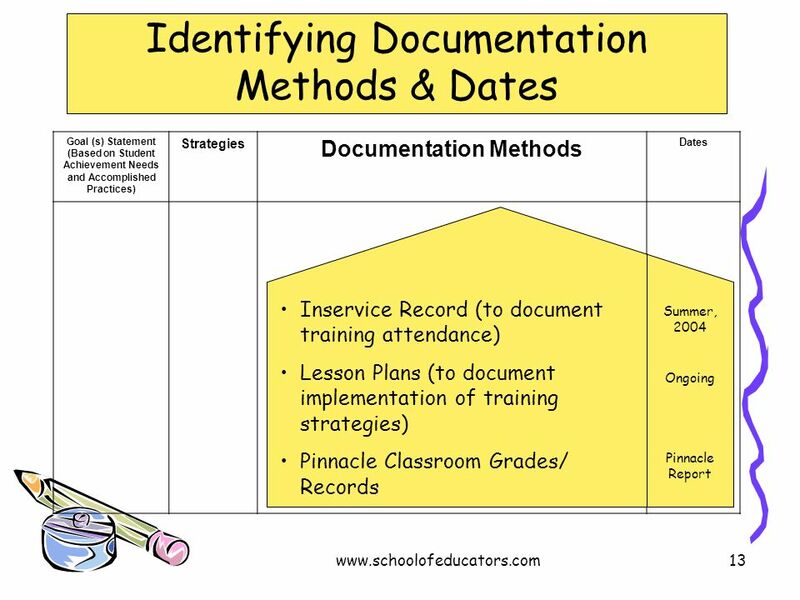 Unclassified Performance Management Process For Unclassified Administrative and Professional (Non-Teaching) Employees Summer 2011. 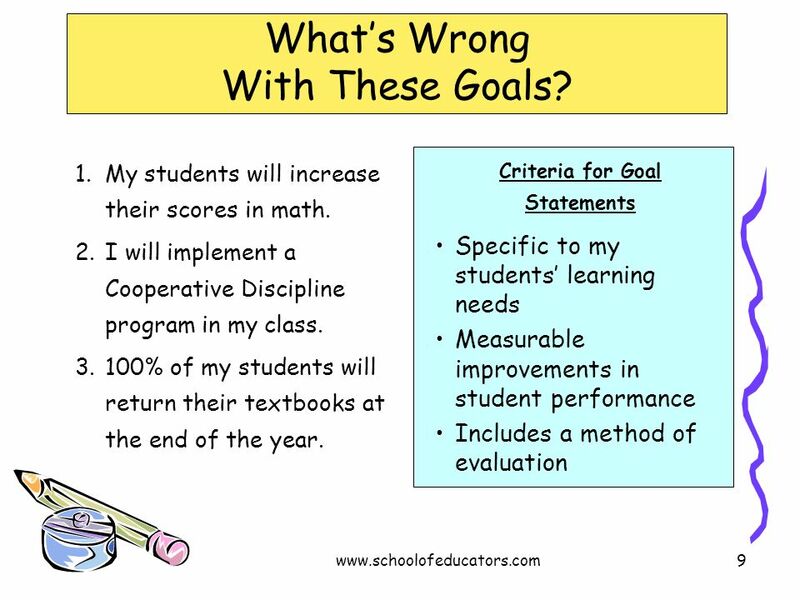 Math Content Network Update The Power of Mistakes Student Engagement Culture of Learning Growth Mindset Congruent Tasks.